Omega Silvertip Shaving Brush Ivory Hanlde 641.Silvertip is the highest quality hair that can be demanded to a shaving brush. It main characteristic is the incredible softness of the tips. It's rarest and most expensive hair that provides from the animal neck. 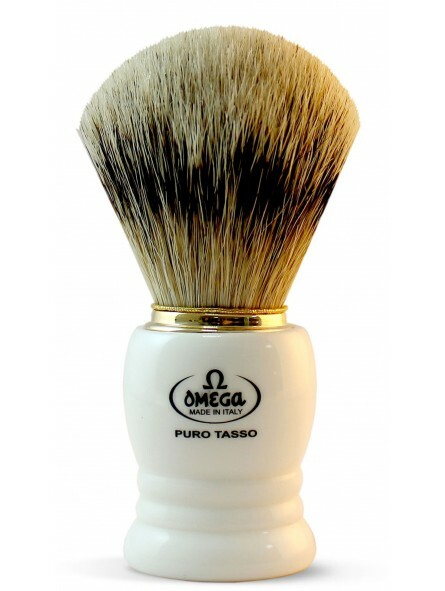 641 Omega shaving brush is offered with an ivory color resin handle. Collar is offered in golden chrome color. LLEVO 45 AÑOS CON ESTA MARCA DE BROCHA Y EL RESULTADO HA SIDO SIEMPRE EXCELENTE. LA PRÓXIMA ME LA COMPRO IGUAL, AUNQUE ME GUSTARÍA QUE FUESE UN POCO MÁS BARATA.